Good evening bloggers, I've been having so much fun entering competitions this week that I couldn't wait until one of my favourites, Less is more released their challenge on Saturday. Once I'd seen it, however, I was truly stumped. 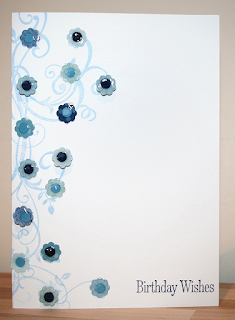 The challenge was for shades of blue, not a colour I use a lot and certainly not more than one shade at a time. 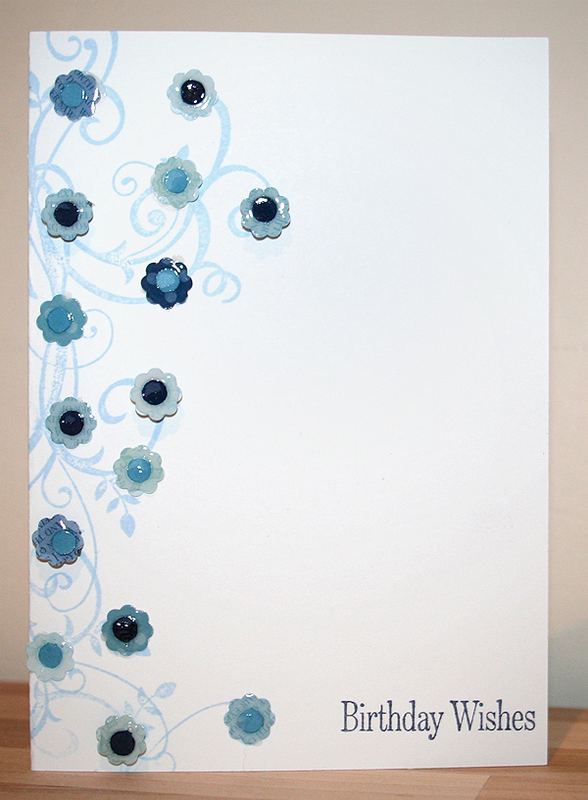 The Baroque motifs stamp was stamped using Bashful Blue, an easy colour to overlook but a beautiful one to use especially for backgrounds. 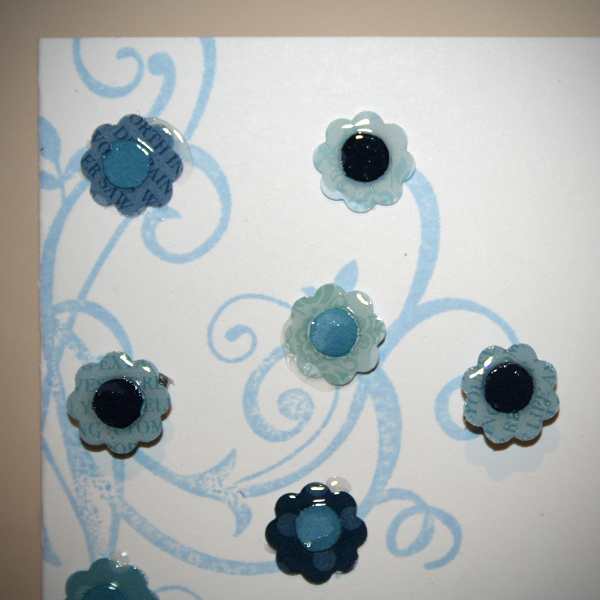 The flowers were punched out of left over pieces of Subtles and Regals designer series paper. The centres were punched out of left over pieces of Marina Mist and Night of Navy card stock using my Crop-a-dile. As the challenge is for clean and simple cards I stamped the sentiment directly onto the right hand bottom corner of the card. I used to be very nervous about doing this as I would spend absolutely ages making an elaborate card only to ruin it at the end by stamping the sentiment on wonky! This time, however, I used my trusty Stamp-a-majig to ensure that it would be straight. 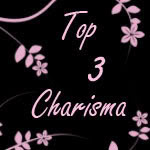 Hi Claire, another fab creation !! Thanks guys, I really like this card and it's lovely to hear from you that you like it too, appreciate the comments and welcome Chris! I love this card.Beautiful blues. Beautiful stamping job. Fabulous card. Lovely idea to gloss the flowers! 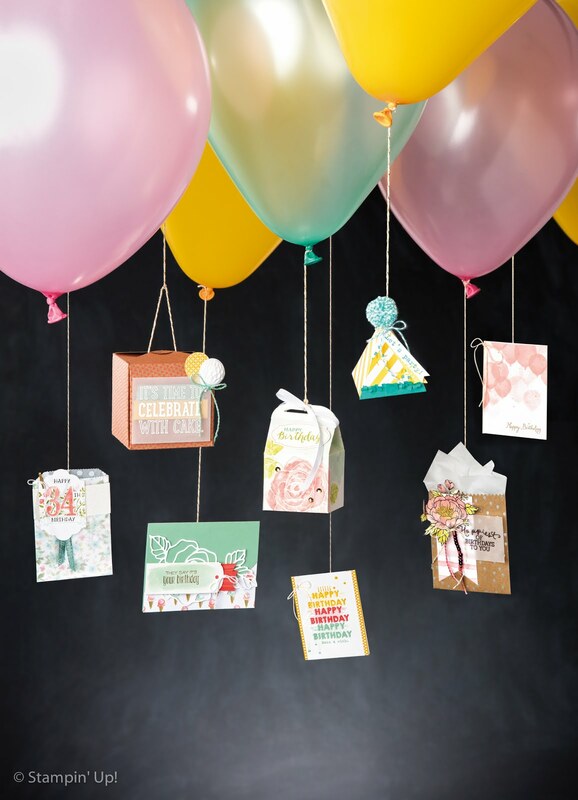 I'm an Independent Stampin' Up Demonstrator in Crossgar, Northern Ireland. I can demonstrate at parties and craft clubs in Hertfordshire, Bedfordshire and puarts of Buckinghamshire. 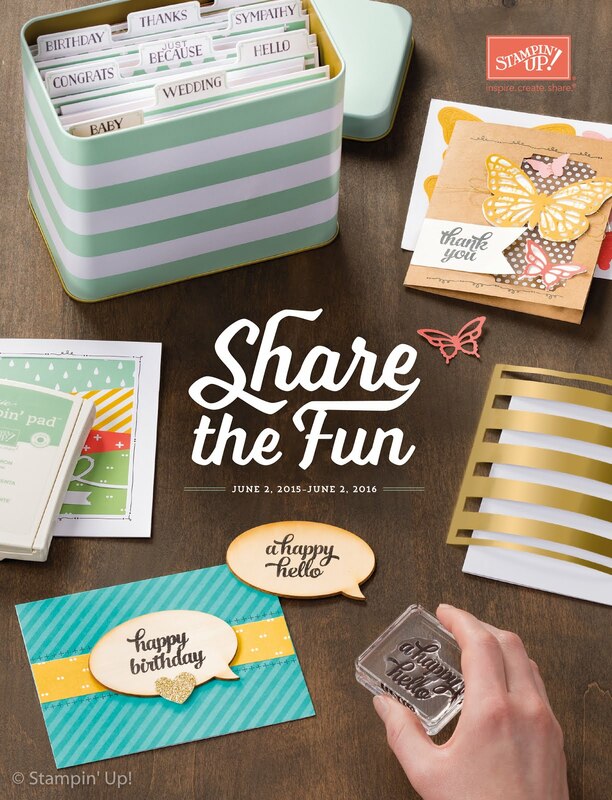 Contact me to place an order, or book a free party to craft with friends in the comfort of your own home! Online shop open 24 hours a day 7 days a week. (Sweet) Buttons (embosslit) and bows.